The other day, when the sun peeked out, King and I met the goats for the first time. My oldest son manages the goat-herd now. They are usually at his little farm nearby. They are here while he makes modifications to his fence and adds another paddock. The goats miss my grandchildren. They run to the gate when we walk by looking for some attention. I give them some, but I walk by that gate often. If I stopped to pet the goats every time, I’d get nothing done. I am very sure they are happiest at their home farm. King is most usually quiet. 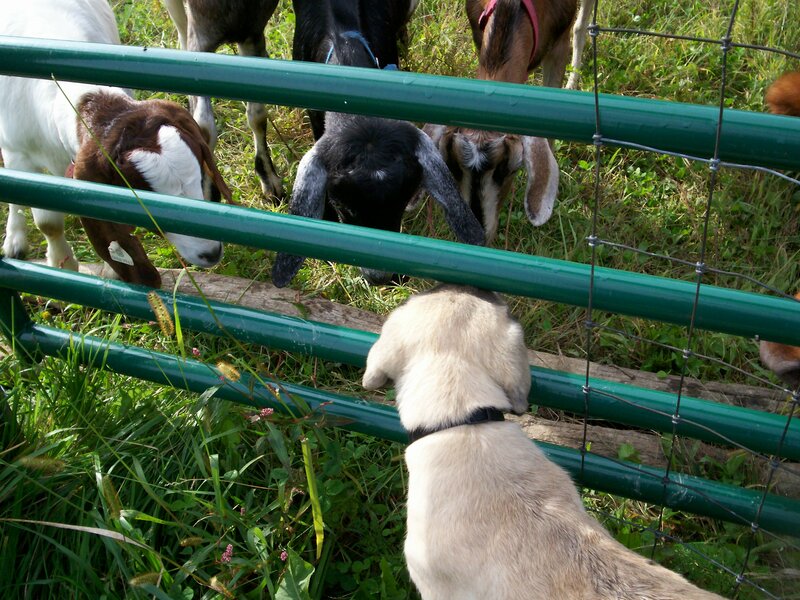 He barks at strange noises, cell phones and now when he makes small talk with the goats. I am still getting used to the whole deal. I don’t mind him barking when needed, but dang, he lets out a bark that curls your hair! The goats jump back three feet, so he thinks they are playing. He jumps and barks until I am too far away for him. Then he rushes off to catch up with me. Making small talk is good for people. It builds character. It puts folks at ease and fills in quiet places. Annoying jabbering is not necessary, but a few quick lines about the weather never hurt anyone. I make enough small talk that some people probably think it’s big talk … or perhaps annoying jabbering 😮 But I greet others anyway! When I work my draft horses, I talk with them while we harness. I visit again once the job is done, but usually when we are working only voice commands are communicated. I will clarify this to say that when we take breaks, I walk around front and talk to each of them. I pet them and I speak with them as I would any other working partner. We discuss the job they are doing, how they are doing it and just how much more is left to go. Once the small talk is over, I take my place on the implement seat, gather my lines and it is off to work we go. Once again, only giving voice commands and direction. I do not want to confuse them. This is my method of working horses, while others may disagree, I know this works for me!